You want to stick to your routine and hit it hard every day, but then life gets in the way. 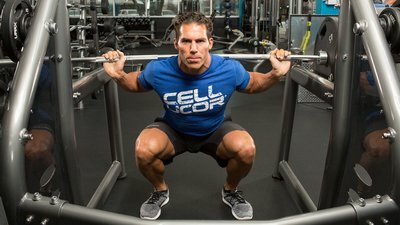 IFBB pro Craig Capurso breaks down five errors that can break up your routine—and how to get it together again. There is no shortage of seemingly legitimate reasons that pop up and either keep you from getting to the gym, or keep you from working hard while you're there. IFBB pro Craig Capurso has heard them all, and breaks down all those reasons into these five basic issues. It's all about staying focused on your goals and not letting anything trip you up. 1. You're doing it for other people. There's lots of pressure out there, influencing how you spend your waking hours: kids, job, family, friends. We all need to do what we need to do, but what do you need to do for you? Look deep down in the mirror. What do you want to accomplish every day? Find out what that is, then make sure you give yourself the time you need to do it. 2. You're not nailing your nutrition. "I eat pretty clean," you say. "My diet's pretty good, for the most part." That's not going to cut it. We're talking about the fuel your body needs to perform at its peak. Don't leave your diet to chance. Prepare your meals in bulk. Go shopping ahead of time. Have stuff prepared. Plan to succeed. 3. You're not following the plan as described. You're doing the workouts, but you're not following the nutrition. Fail! You're doing the workouts, but you're not following the rest timing. Fail! You're doing the workouts, but you're not following the intensity. Another fail! A lot of work goes into building a good workout program. Show it—and yourself—respect by following it exactly, so you can continue to progress. 4. You're not sleeping enough. If you don't get enough sleep, you're not going to have enough energy to get through the day—either physically or mentally. Get at least seven hours of sleep. That will give you the fortitude to say "no" to cheat meals and cravings, and to say "yes" to throwing all you've got at your workout. 5. You're comparing yourself to media models. I'm actually one of these people who gets paid to look a specific way. Photographers will take about 25 different shots just to get the one that works for them. It's crazy: When I look at some of these pictures I just think to myself "there's no way I could ever come up with a shot like that". So when you're reviewing your own photos, don't expect perfection. Do your best and be happy with who you are!